Synergies is joint action and working together. 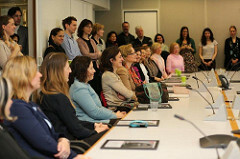 As part of last week’s International Women’s day, the BRS secretariat and the Geneva Environment Network celebrated inspirational women in Geneva working together for the environment. The response to our call to find such inspirational women was overwhelming. We received a total of 160 nominations. It is fair to say that all of the nominated women deserved to be recognised and selecting twenty women to shine the light on was a hard task. The 20 inspirational women that were selected by a small committee comprising of BRS, GEN and government representatives (men and women) represent a wide range of organizations, sectors, functions and nationalities. Some of the dynamic, knowledgeable, bold and enthusiastic women are from the UN family or intergovernmental organizations; from UNEP, UNECE, the Secretariat of the Aarhus Convention, UNDP REDD+, UNITAR, the International Trade Center (ITC), the International Organization for Migration (IOM), the World Meteorological Organization (WMO), the World Health Organization (WHO), the World Intellectual Property Organization (WIPO), and the International Telecommunication Union (ITU). Civil society is also represented by passionate and dedicated women from WWF, the International Institute on Sustainable Development and the Programme for the Endorsement of Forest Certification. We also celebrated respected, motivated and motivating women from the private sector, namely from the World Business Council for Sustainable Development and Transparence. Last but not the least, the committee acknowledged the important contribution of wise and insightful visionaries from the University of Geneva and the Swiss Parliament. Lisa Mazzone, a Swiss green party member of the Swiss Parliament. The event was coupled with a portrait exhibition of our 20 awardees at the International Environment House here in Geneva. The nomination process provides much food for thought. Most of the nominations came through a bottom up process, whereby colleagues or staff put a name of a supervisor forward. Many of the nominated were supported by team nominations. Many of the women were nominated by male colleagues. We also saw a few instances of a supervisor putting a name forward. I find it really encouraging that we can see years of mainstreaming efforts bearing fruit, as many of the nominated women work for organizations or entities the focus of which is not environmental matters as such but where environment and sustainability is important. I would like to place a challenge for next year. Let’s look at nominating women who work to support and enable leaders and agendas. Let’s recognise women from all UN regions who work to make change happen for the betterment of environment and sustainable development. Ever since the signing of the Charter of the United Nations in 1945, the first international agreement to affirm the principle of equality between women and men, the UN has contributed to the advancement of the status of women worldwide. It is absolutely essential that gender equality is promoted and ensured through internationally agreed strategies, standards, programmes and goals, such as the Sustainable Development Goal on gender equality. In my experience, the greatest impact is achieved through the daily on the ground work that we do – both men and women – to recognise, advance and respect gender equality. It is only when we in our work and lives have completely assimilated the view that men and women, girls and boys should have equal choices, equal opportunities, equal access – and shoulder responsibility in equal measure - that we have achieved our goal. This is not to say that equality means that we strive for sameness of men and women, but rather that the differences among us are a great strength. Being in an international setting, with varying cultural backgrounds and expectations, makes the challenge all the more interesting and complex.